“The second argument is based on ‘they shall never perish.’ John 3:36 teaches that the converse is true of unbelievers when it says, ‘He who does not believe the Son shall not see life.’ No one says that, since it is said of the unbeliever that he shall not see life, he is permanently bound without hope in that condition. It is a fact that, as an unbeliever, he shall not see life, but if he becomes a believer, he will see life. Now, if the words ‘shall not see life,’ which describe the unbeliever, are not contradicted when the unbeliever becomes a believer and sees life, where is the contradiction when it is said that a believer ‘shall not perish,’ but if he becomes an unbeliever he will perish? The fact is that a believer, as long as he remains a believer, ‘shall not perish’” (F. Leroy Forlines, Classical Arminianism: A Theology of Salvation. Nashville: Randall House, 2011, page 311). John 10:28-29 is often advanced by Calvinists and common believers alike as verses that “unequivocally” attest to the eternal security of the believer. But very few people understand that, while the concept of the believer’s security is a theological one, the nature of that security (whether eternal or conditional) is a philosophical one. And hermeneutics, a philosophical tool, is valuable to what the nature of security in Christ is deemed to be. For those who say philosophy does not matter, think again: hermeneutics is philosophy...and it is sorely needed if one intends to arrive at sound reasoning in the biblical text. Dr. Forlines provides food for thought when he says that, in discussions of the unbeliever’s condition, no one deems the unbeliever’s state as eternal. In fact, this is true of Christians all across the board. With the exception of some five-point Calvinists who deem the “reprobate” eternally lost, most believers seem to have optimism towards those who are currently under the wrath of God---that is, as long as there’s time, there’s always hope that a lost individual would come to Christ for salvation. However...a different thing entirely is stated in regards to the believer. When a person becomes a believer, all of a sudden, that person’s state is unchangeable. That person, according to proponents of Eternal Security, can never become an unbeliever again. But why is this the case? The reasons have never been stated. The idea of “eternal” security is simply assumed, while the possibility of “eternal damnation” on the head of the unbeliever is never even given a second thought. There is still a great need to challenge cherished assumptions about salvation, the believer, and his or her security in Christ. So what is to be said of “they shall never perish” in John 10:28-29? To solve this puzzle, one needs to examine another cherished presupposition regarding salvation: that is, that a one-time confession in Christ as Lord and Savior is all it takes for salvation. The challenge to the idea of “Once Saved, Always Saved” (OSAS) can be found within the text of John 10:28-29 itself. Notice that the text talks about sheep who “hear My voice...and they follow Me” (John 10:27). What does it mean to “follow” someone? Does the word “follow” refer to a one-time observance of the deeds, words, and actions of another? No. Rather, the word “follow” demonstrates a continued pattern of life lived on the basis of the example of someone else. In the context of John 10:28-29, then, Jesus’ statement about His sheep following Him means that they observe His words, deeds, and actions for a lifetime. The following there is no temporary following, or one-time following. This is why Jesus gives these sheep “eternal life” in verse 28. The sheep of this passage experience eternal life because they commit to “eternally” following Christ. They are in it forever and ever, not for a one-time deed or statement. Last but not least, notice that in the context of John 10:28-29, such sheep are not merely “confessing Christ.” Rather, they are living the life of a follower. It is the “following” that Jesus is concerned about. Yes, He desires we confess Him before men, as is demonstrated by Matthew 10:32 and Luke 12:8. At the same time, however, anyone can confess Jesus is Lord and follow Him temporarily---just look at the “rocky soil” of Jesus’ Parable of the Sower, the one who only believes/endures for a time (Matthew 13:20-21; Mark 4:16-17; Luke 8:13). Anyone can follow the Lord Jesus for a short period of time; however, it is the person that hears the word, endures, and bears much fruit that pleases the Lord (Matthew 13:23; Mark 4:20; Luke 8:15). 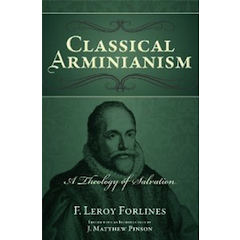 Dr. Forlines (with the editing skills of Dr. Matthew Pinson, president of Free Will Baptist Bible College) has done a great job in producing a systematic theology for Classical (or Reformed) Arminians everywhere. The deadliest blow to Calvinism here is that many Calvinists would agree with Reformed Arminians: a person must also be doing good works in addition to a profession of faith in order to have confidence that he or she is a child of God. After all, good works are the purpose of the Christian life (Eph. 2:10), and doing good works brings glory to God (Matthew 5:16). Calvinists actually believe that the elect, the chosen ones of God, will produce good fruit in their lives because “God chose them.” Although I disagree with the Classical Calvinist notion of election, I do agree with the Classic Calvinist emphasis on the necessity of good works in the Christian life. However, if such works are necessary (and many Christians seem to agree), then the security promised in John 10:28-29 is concurrent with a life filled with good works...and such security is conditional upon those good works (“hearing Jesus’ voice, following Him”). Jesus will not forever strive with a tree that does not bear fruit (Luke 13:6-7).